← A little bit of snow and no cappuccino! I usually turn right when I get out of my building. This is the easiest way to get to Slussen or Götgatan. Even to go to Mariatorget I would turn right even though it would make more sense to turn left. And this is what I did this morning. I had a “coffee date” with a friend of a friend at 11:00. She was coming from Uppsala so we agreed to meet at Cafe Rival. It is after all a rather nice place and it is quite easy to find for someone from out of town. But I was up early this morning so I decided to explore a new part of my neighborhood! I had no idea what I had been missing so far. There were so many nice cafés hidden in those small cobbled streets. I didn’t know in which café to go. And as I was walking around trying to make up my mind I saw Mariaberget! 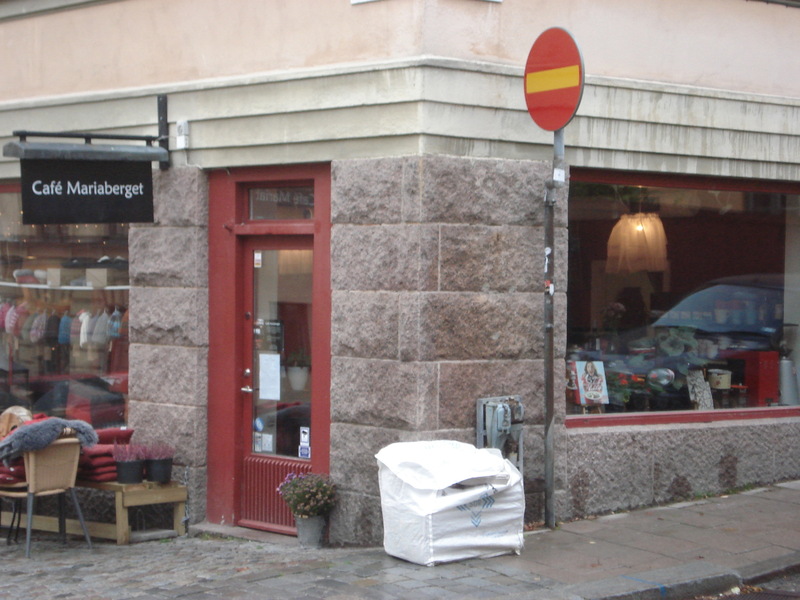 Café Mariaberget is right on the corner of Bastugatan and Blecktornsgränd. It is a small place with beautiful paintings on the walls. The paintings that were on the walls today have been there for quite some time. The owner knows the son of the painter and customers like them a lot. With good reason. But they are sometime taken down to show temporary exhibition. As soon as you walk in the café you are right in front of the counter. The owner looked at me and said something in Swedish, naturally. So with my best accent ever I say “Ursäkta, jag talar inte svenska”. My new friend immediately apologized and started speaking English. I had to tell him not to apologize! We are in Sweden after all, I am the one who is apologizing for not speaking your language. He thought I was funny! Anyway, he explained that the café was not quite open yet but he would be happy to serve me a coffee or a cold sandwich but they are not quite ready to serve hot breakfasts. Now I feel bad and I want to walk away but the owner is just too happy to speak English, and when I told him I just moved down the street he said that he is always open for “regulars”. 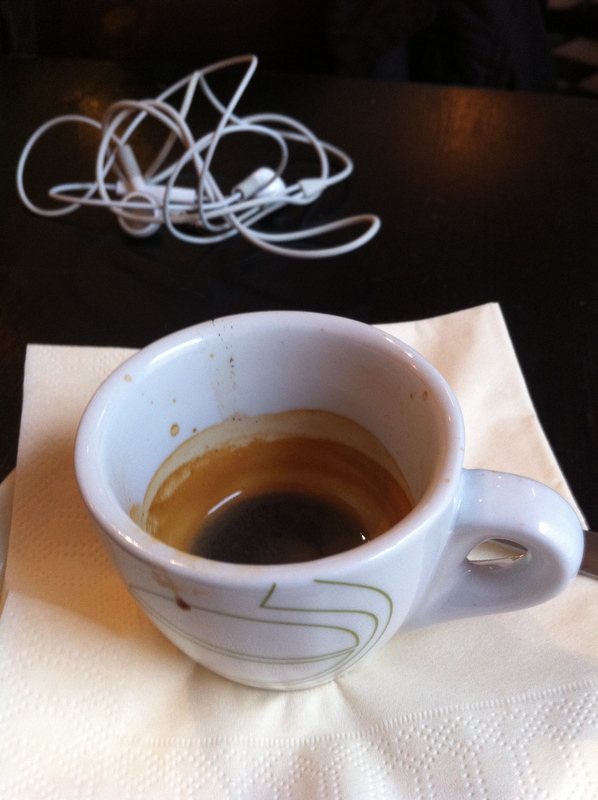 I had a very nice espresso! A good start for a Saturday morning. 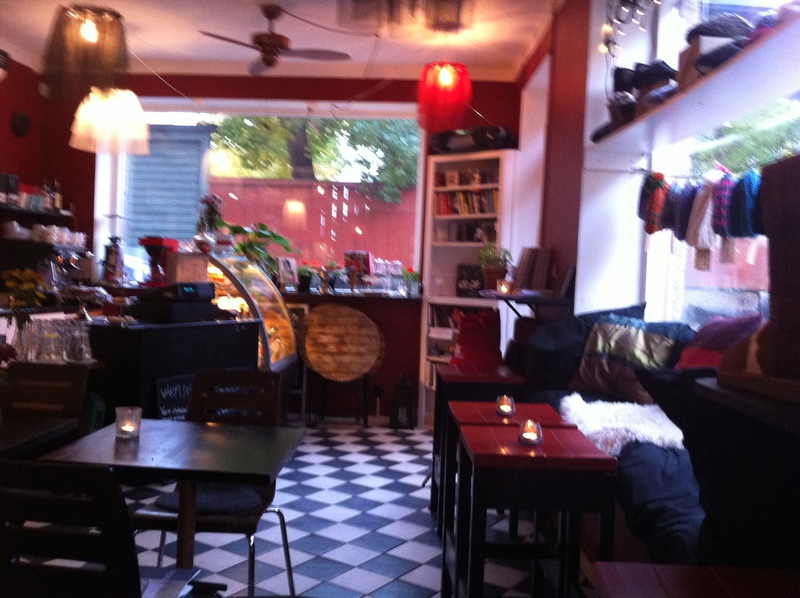 Café Mariaberget has a very nice vibe. There is a bookshelf right in the corner, behind the door, which makes the place feels very warm. And all those toques hanging by the window add to this warm feeling. 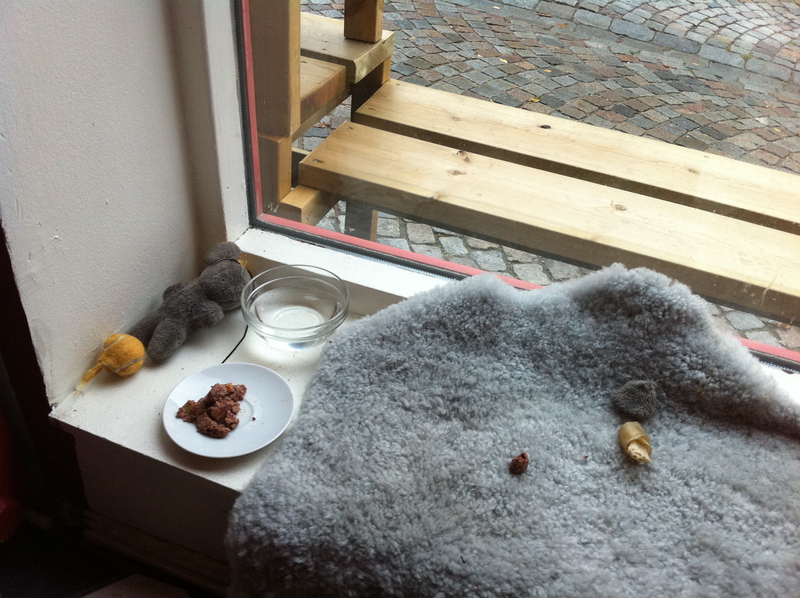 And so is the dog who was leaving for a walk when I got in but obviously has its own spot in the café! We're not quite open yet! A place for man's best friend. The owner was right. I will be a regular!